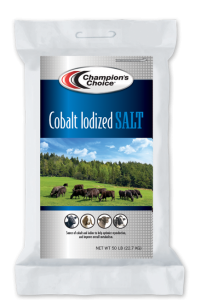 A fine-screened bag and block salt with cobalt and iodine that helps cattle, sheep, and goats synthesize vitamin B12 and plays a role in thermoregulation, intermediary metabolism, and reproductive growth and development. Iodine deficiencies in livestock can lead to goiter (an enlargement of the thyroid gland), a condition most often found in young animals. 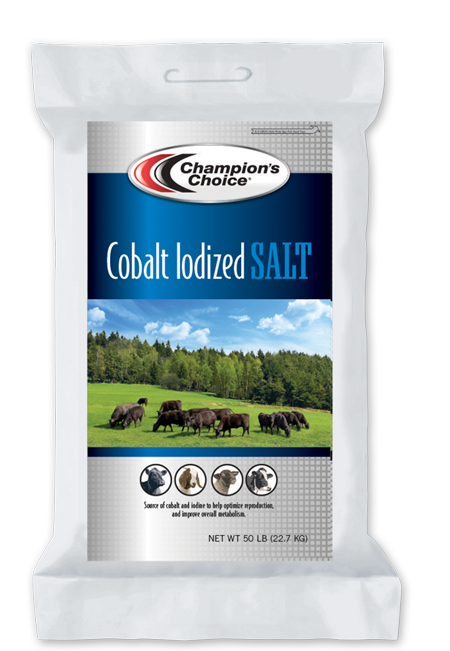 Cobalt iodized salt blocks are weather resistant for free choice feeding. Salt, Calcium Carbonate, Cobalt Carbonate, Calcium Iodate, Mineral Oil, FD&C Blue #1 Lake. What are the symptoms of cobalt mineral deficiency in animals?